He was the most famous physician, philosopher, encyclopaedist, mathematician and astronomer of his time. His major contribution to medical science was his famous book al-Qanun, known as the "Canon" in the West. The Qanun fi al-Tibb is an immense encyclopaedia of medicine extending over a million words. It surveyed the entire medical knowledge available from ancient and Muslim sources. Due to its systematic approach, "formal perfection as well as its intrinsic value, the Qanun superseded Razi's Hawi, Ali Ibn Abbas's Maliki, and even the works of Galen, and remained supreme for six centuries". In addition to bringing together the then available knowledge, the book is rich with the author's original eontribution. His important original contribution includes such advances as recognition of the contagious nature of phthisis and tuberculosis; distribution of diseases by water and soil, and interaction between psychology and health. 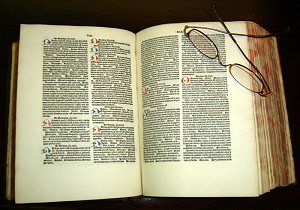 In addition to describing pharmacological methods, the book described 760 drugs and became the most authentic materia medica of the era. He was also the first to describe meningitis and made rich contributions to anatomy, gynaecology and child health. Pictured: "Canons of Medicine" from Avicenna (Ibn Sina), in latin translation. The book Book is located at UT Health Science Center's library. Glasses placed in the photograph to demonstrate scale. 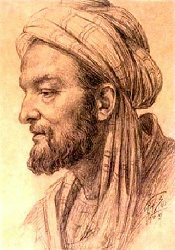 Ibn Sina also contributed to mathematics, physics, music and other fields. He explained the "casting out of nines" and its application to the verification of squares and cubes. He made several astronomical observations, and devised a contrivance similar to the vernier, to increase the precision of instrumental readings. In physics, his contribution comprised the study of different forms of energy, heat, light and mechanical, and such concepts as force, vacuum and infinity. He made the important observation that if the perception of light is due to the emission of some sort of particles by the luminous source, the speed of light must be finite. He propounded an interconnection between time and motion, and also made investigations on specific gravity and used an air thermometer. In the field of music, his contribution was an improvement over Farabi's work and was far ahead of knowledge prevailing elsewhere on the subject. Doubling with the fourth and fifth was a 'great' step towards the harmonic system and doubling with the third seems to have also been allowed. Ibn Sina observed that in the series of consonances represented by (n + 1)/n, the ear is unable to distinguish them when n = 45. In the field of chemistry, he did not believe in the possibility of chemical transmutation because, in his opinion, the metals differed in a fundamental sense. These views were radically opposed to those prevailing at the time. His treatise on minerals was one of the "main" sources of geology of the Christian encyclopaedists of the thirteenth century. Besides Shifa his well-known treatises in philosophy are al-Najat and Isharat.